Advent is Not Christmas: And It’s A Good Thing Too! If Barth is right we are in a heap of trouble in North America. Advent here has been overrun by Christmas, our cultural version of Christmas, giving it no time or attention in our hurry to get to Christmas. Where Advent and the church year have gained a foothold over the last several decades in some traditions Advent has been treated as a prelude or preface to Christmas. Its authentic voice and role in the life and worship of these churcheshas been denatured and diluted by Christmas. 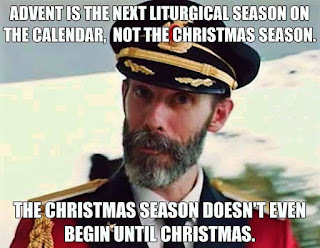 Captain Obvious gives us the obvious answer: restore Advent to it proper role and function in the church. As with all obvious answers, however, the how to do it is never clear or easy. Or even if clear, not easy.